Why is an eighth grader smarter than Microsoft Word? Because the kids can spell words that Word can’t! The 2013 Scripps National Spelling Bee in the USA got us wondering how Microsoft Word would cope. So we fired up Word 2013 with the latest English (US) dictionary as supplied by Microsoft. 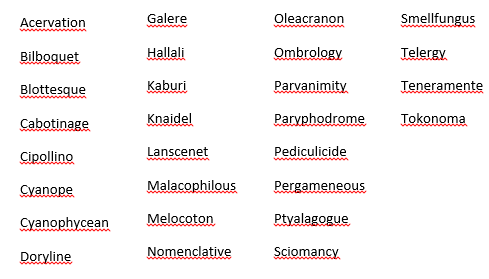 We selected 30 words used in the final rounds of the spelling bee, Microsoft Word only recognized two of them. All the rest had the dreaded red squiggly line underneath. Schadenfreude – is recognized by Word 2013. But only when capitalized. Probably because, as Wikipedia notes “the term schadenfreude is sometimes capitalized to mimic German-language convention as German nouns are always capitalized”. Alas, the clever transposed variant ‘Freudenschade‘ (sorrow at another persons success) isn’t recognized by Word 2013. Ignimbrite a geological term definition is recognized by Word 2013. All these words are unrecognized by Word 2013 US English – capitalized or not. All these words are quite obscure, the public/free version of the Merriam-Webster dictionary (used in the Scripps Spelling Bee) doesn’t list most of these words. So it’s no surprise that the default Word dictionary doesn’t have them.